Fusion cuisine has become tremendously popular over the last few years. It definitely is the craze here in Minneapolis. Restaurants like Azia, and Harry's boast menus that blend Asian, French, American, and even Hawaiian influences. Somehow, these chefs seem to achieve the right balance of flavors and textures to create distinctive dishes. Recently, I have begun dabbling in a little fusion myself. Greek and Indian. Essentially, I combined two signature dishes of these great culinary nations: spanakopita and samosas. Samosas are traditionally made with potatoes which I replaced here with butter beans. I found that beans added more flavor to this dish, not to mention the bonus nutritional content. 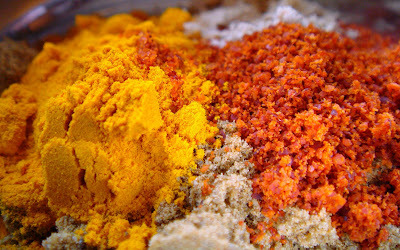 Personally, the best part of creating this dish was being able to use this mix of spices, in particular turmeric. I used turmeric quite often in the Caribbean but seldom after I moved. Possibly due to the fact that while I was growing up I associated it with Indian-Caribbean culture, therefore I never ventured to use it outside of that cuisine. It also has a somewhat bitter flavor and distinctive odor which means that it does not blend well with most ingredients. However, with spinach and beans it works like an HDMI cord on a plasma TV. Ok, ridiculous analogy but it's all I can come up with at 11 pm. (We are shopping for a new home theatre system, so for the past month all the talk around here has been plasma this, surround sound that, 1080 p this, you get the picture.) What this means is that the turmeric enhances the spinach while adding that distinctive Indian flavor. Exactly what I wanted. I think this is just the beginning of my venture into the world of fusion cooking. Stayed tuned for more. 2. Place a large skillet over medium heat. Once hot, add the olive oil and cook onions and garlic until soft and translucent, about 5 minutes. 3. Add cumin, tumeric, ginger, chili, and mango powder. Add 2 or 3 tablespoons hot water to prevent sticking. Mix and cook for 2 more minutes or until water has evaporated and onions have softened further. 4. Add drained beans to onions, mix and continue cooking for 3 minutes. Using a hand held potato masher, mash beans and onion mixture thoroughly, making sure that no bean is left whole. Add spinach and mix well so that both beans and spinach are thoroughly incorporated. Cover and cook for 5 minutes. If using fresh spinach, cook until all the liquid has evaporated. Season with salt and pepper. 5. Lay one phyllo sheet on a clean working surface and brush with olive oil. Place another sheet on top and brush that second sheet with more olive oil. Repeat until you have a stack of 5 to 6 sheets. 6. Spoon 1 cup of spinach mixture along the shorter end of the phyllo sheets, 2" from the edge. Place the 2" flap on top of spinach and roll up to form a log. Squeeze and tuck edges under. Place on a baking sheet that has been sprayed with cooking spray. Repeat with remaining spinach mixture and phyllo sheets. Brush tops lightly with olive oil. 7. Bake at 350 degrees F for 45 minutes until golden brown. Remove from oven and cool for 10 to 15 minutes before serving. 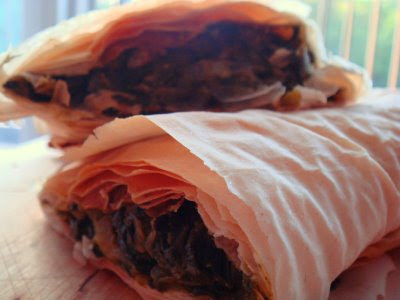 * Frozen phyllo dough needs to be thawed for four to five hours before using.